ysabetwordsmith | Poem: "Into Habits of Companionship"
Poem: "Into Habits of Companionship"
This poem was written outside the regular prompt calls based on discussions with lynnoconnacht, redsixwing, technoshaman, and dialecticdreamer. It has been sponsored by Anthony & Shirley Barrette. It belongs to the series Frankenstein's Family. "I'm gut-loading the mice for Fridrik,"
hired me to take care of his snakes and lizards,"
something you want the predator to swallow. why they eat the whole animal." to kill off most of the leaves," Victor said. "That and some dried herbs," Igor said. and latched the door, leaving the other out. "I'll take these up to Fridrik shortly." "What are you making for us?" as he washed his hands in the sink. a pork sausage, and a lot of paprika." the tops aside to save for the mice. tinting the soup a rich red-orange. and sliced them into thick rounds. and headed toward Fridrik's room. special to the mice?" Victor asked. Janika, and she thought it was worth a try. but he came around because they taste better." "Gourmet mice," Victor said, chuckling. I think someone has been poisoning werewolves." Janika are touchy about what they eat. have picked it up from her yet." "I just hope he's in a decent mood today,"
Victor said as they approached the room. making his mood erratic at best. if not us," Igor pointed out. and then pushed it open. against the stress of his injury. pricking toward the new visitors. "I brought you a midafternoon snack,"
to stun the mice. Fridrik's tail thumped the bed. so that Fridrik could get his muzzle inside. One, two, three bites and the mice disappeared. Fridrik licked his chops, giving a satisfied sigh. and settled into the empty chair. healed amazingly fast with good care. "You're doing well," Victor told him. "These stitches are ready to come out." the punctures and rebandaged Fridrik's leg. "By the way, those mice came from Crina,"
needs to be with her discoveries." delicately touching the edge of Igor's hand. and scratching, while Fridrik wagged his tail again. Fridrik's flank, marveling at the coarse fur. over the other man's lap. "Turnip greens," said Fridrik, "and valerian." "Kale, not turnip, but they're related,"
said Igor. "You're right about the valerian. It's good for easing pain and anxiety." "Kale?" said Fridrik. "I don't know that one." that grows into the winter months," Igor said. "Csilla says it helps replenish lost blood. so I'm letting the mice have the last bits." where pellets of ice rattled against the glass. The weather was turning unpleasant again. "I hate being stuck inside," he said. "I miss the winter wind in my fur." be able to go outside," Victor assured him. "You may even catch the tail of winter." the woods should be safe again," Igor said. where they are to avoid them." "Artúr is truly gone?" Fridrik said. for the sake of a werewolf?" he can get away with," said Victor. "And if someone else offends you?" under the line of his words. and I hope people come to understand that,"
unacceptable, but he refused to change. our community, and why he had to leave." as he stirred against the mattress. "I can feel you worrying about your security,"
Igor said. "You don't need to fear banishment. but they're determined to make it work." then away. "Pillow?" Fridrik whispered. to settle it in the soft embrace. "Yes," Fridrik said with a fractional nod. and Igor stroked the back of his forearm. more reserved with humans until recently. might in time bring the two together. that he had left in the room. Fridrik tilted his head, considering. down over her slim strong body. "I would like to hear more," she said. in his chair, his toes just touching Victor's boots. then it would soon break free of the snow. Smiling, he chose a poem and began to read. "See! Winter comes, to rule the varied Year ..."
"It contributes greatly towards a man's moral and intellectual health, to be brought into habits of companionship with individuals unlike himself, who care little for his pursuits, and whose sphere and abilities he must go out of himself to appreciate." Gut loading is a technique often used in feeding reptiles and amphibians. It works with other predators too. Supa de cartofi cu carnati is a potato soup with sausages. Kale is a cruciferous vegetable that is high in iron and other nutrients. It is one of the few vegetables that can be grown well into the winter. Wolf hunting has long included the use of poisons such as Aconitum or Letharia vulpina. The book Wolf and Coyote Trapping has a chapter on poisons. Fridrik shows signs of PTSD from previous trauma, due to human hostility against werewolves. 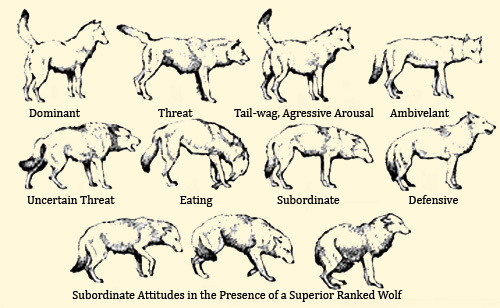 Wolves use body language to communicate respective ranks. Folding the ears and showing the throat are signs of submission. Tail wagging shows friendliness. 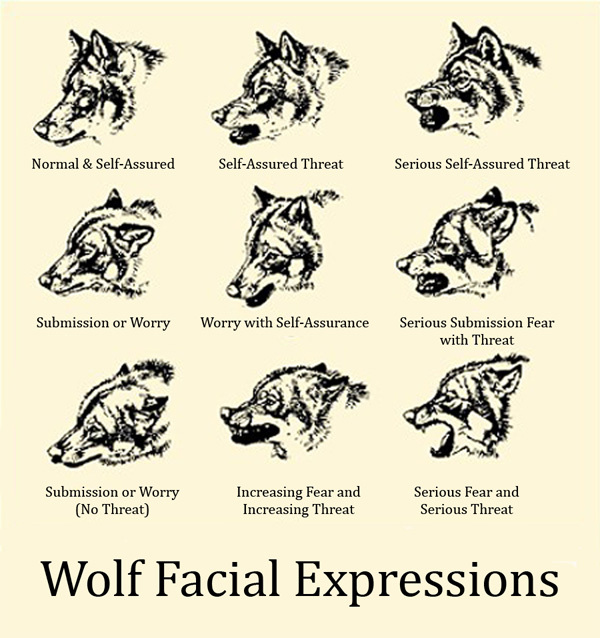 Here you can see illustrations of body postures and facial expressions in wolves. In this photo, the white wolf shows dominant body language while the tan ones are submissive. Valerian is a soothing herb. Trust issues can come from trauma such as child abuse/neglect or other boundary violations. People learn to anticipate terrible outcomes, and even if they move to a better environment, it takes time to relearn more positive narratives. Learning to trust can prove difficult, especially after being hurt. You can see the hesitation in Fridrik's behavior. There are ways to earn the trust of a trauma survivor or an abused animal. There are general trustbuilding steps too. Both Victor and Igor do what they can to support this process, although Igor is better at emotional intelligence in general and wolf body language in particular. Chemotaxis is a response to chemical stimulation, and includes family bonding. Scent rolling in wolves is another example, and it's related to marking other wolves as pack. When the werewolves begin making more physical contact, it shows that they accept people as allies at least, packmates at best. Wolf packs tend to have a stable territory of 125-310 square kilometers (77-192 square miles). Borders fluctuate mildly over time, and may overlap those of neighboring packs by about 2 kilometers (over a mile). This matches the size of many mountain valleys, and like humans, wolves often make use of natural boundaries to define their territories. That makes the current locale a great fit for them. Victor is reading from "The Seasons: Winter" by James Thomson. Ooooh. I love the characterization here, and the way everyone is falling into the idea of family. They've all been knocked around enough to find that difficult, but they're making great progress now that they have people around who are actually worth being with. They actually have Fridrik in another room at present, which is one reason why Victor and Igor are sitting in chairs alongside it. But they would all fit in the big bed. If you cook kale the same way you would turnip greens, you can't tell the difference. Or, at least, I can't. Kale can be cooked in various ways -- stewed like turnip greens, baked into chips, etc. I like the shift here, from the delicious-sounding soup to Fridrik relishing his mice and picking out flavors much the way a human gourmet does. Nature poems sound like an excellent choice, although with Borrowed Thyme, I'm now admiring the werewolves' flexibility with words, to enjoy poetry in a second (or third) language, alongside their other skills. They do get good food. Not all of my characters pay that much attention to it, but the ones who do, I enjoy following along. Then when I am out in the world, sometimes I recognize things and decide to try them. :D Some animals have very discerning tastes, and others don't seem to care. Wolves occasionally bury whole carcasses, not just preserving "leftovers" in case they miss a kill, but because they like eating "seasoned" meat. They have to be fluent in another language, just like all minorities. Nobody else speaks their heritage language, so if they want to have social interaction with humans rather than just fighting or stealing, then the werewolves have to learn the local vernacular. It's the Dacian at risk of disappearing, but they're stubborn about holding onto it. Yay them. How much they actually get out of things like poetry, songs, stories, etc. beyond the basics of "I will trade you this rabbit for that wool hat" is anyone's guess. I like this one. I'm glad Fridrik is mending, though it's tough to have to wait while it happens. I may have to try that soup, too! He's already antsy, poor guy. It's getting better, though. Werewolves heal better and faster than humans. What would've taken months for a human, and left crippling scars behind, will heal in a few weeks on him and he'll probably be fine. It should work with pretty much any root vegetables that you like. It's the sausage the carries the dish, so get the best you can find. Valerian is not merely a soothing herb, it's a muscle relaxant and a nerve stimulant, and thus may not be suitable for people with heart conditions. However, an oil infused with valerian can be used in massage to help work out cramps and knots through skin induction (where the active ingredients are passed through the skin by a carrier material; this is used often with medicinal patches like nicotine, testosterone, and other such things). Note that valerian also contains alkaloids, which are often dangerous to humans, though this herb is considered safe for use -- do not use with MAOIs, which enhance the body's response to many chemicals, particularly alkaloids. Herbal medicine, like the chemical kind, is complicated. For literary purposes, I summarize what it's being used for in that instance, with a link to more detailed references. I'm glad to see that Fridrik is healing and is slowly gaining some trust in Victor and Igor. It's hard on Fridrik, but in some ways, the convalescence is helping. It puts him in close, sustained proximity with humans and shows that not all of them will take advantage of vulnerability.